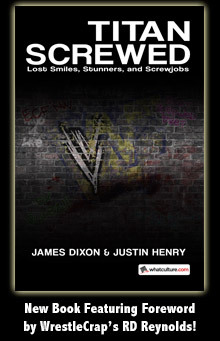 Headlies: Daniel Bryan Recycles His WWE Championship - WrestleCrap - The Very Worst of Pro Wrestling! Aberdeen, WA – Following his title loss at Wrestlemania, former WWE champion Daniel Bryan has decided to recycle his championship belt. 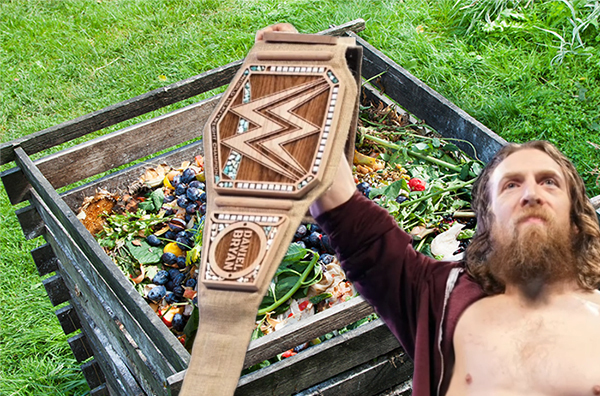 Made from 100% eco-friendly organic hemp, naturally fallen oak, and naturally-sourced stones, Bryan’s championship was a symbol of his environmentalism and rage against the greedy Baby Boomers and corporate machine. Bryan has removed the hemp from the belt and fashioned a new flannel top for his good friend and “intellectual equal” Erick Rowan. The stones were then used to create a sundial for a community garden. All the adhesive used to keep the belt together was melted down and turned into hair pomade. Finally, Bryan used the wood to create a tiny theme park for rabbits, squirrels, and other small woodland creatures. The former champion looked upon his work and shed a single tear. He then captured the tear in a jar that he plans to use for pickling pesticide-free cucumbers. 4 Responses to "Headlies: Daniel Bryan Recycles His WWE Championship"
Imagine the plentiful bounty that could be reclaimed if you could recycle all of Sable’s wooden line readings. Is it wrong that I actually kinda liked the look of this belt (sorry i mean Championship)? No, it was friggin’ awesome. Absolutely unique. There’s a certain look of timeless craftsmanship to wooden items that can’t quite be replicated by anything else. Besides, the “normal” championship belt is incredibly cheap-looking and boring anyway (compared to what the WWE championship looked like in days past, when it wasn’t just a big ‘W’on a black leather strap with a couple of side plates).